On the first weekend in September me and my friends from Quito went to Ecuador’s Coast – Puerto Lopez. Ever since I was a child, I have dreamed of seeing humpback whales and hoped to have this opportunity during my six-month stay in Ecuador. After a ten-hour bus ride we finally got to the little town of Puerto Lopez (you can also fly there), famous for its spectacular whale watching opportunities. To explore even more of the coastal biodiversity, we decided to book a tour to Isla de La Plata which combines birdwatching, snorkeling and whale watching. What a rough sea!! If you tend to get sea sick, you should definitely bring medication. For us it was a very funny boat ride, almost like rafting. When we already thought we would not spot any whales, suddenly another boat found a group of the migratory animals. It was even more impressive than I would have expected it to be. Everybody cheered and we had to fight back our tears due to the touching whales. This definitely was a moment I will never forget. Heading on to the island we were surprised by sea turtles and pelicans that were attracted by a fishing boat. It almost felt like being on the Galápagos. During our stay on the island we saw crabs, lizards, blue-footed boobies, frigate birds and many other animals. After a strengthening sandwich and local fruits we could go snorkeling near the coast. It is amazing what you can discover when snorkeling. Colorful wrasses, sea urchins and brown and white corals completed our experience. As it was already 5 pm we started to get cold and so went back to the Ecuadorian mainland. During our way back the real surprise waited for us: Out of nowhere a giant humpback whale jumped out of the ocean – close to our ship. And not only once. After a period of admiring I decided to take some photos and there was even time left for videos. This whale did an outstanding performance and seemed to want to say goodbye to us when waving with his flippers. Ecuador indeed makes you feel happy! Before having to leave Puerto Lopez again we passed a day at the city’s beach, admiring the fishing pelicans that rushed from the sky into the sea. Finally we prepared for the bus ride with the delicious banana cake and some relaxing minutes in the hammocks of our hostel . 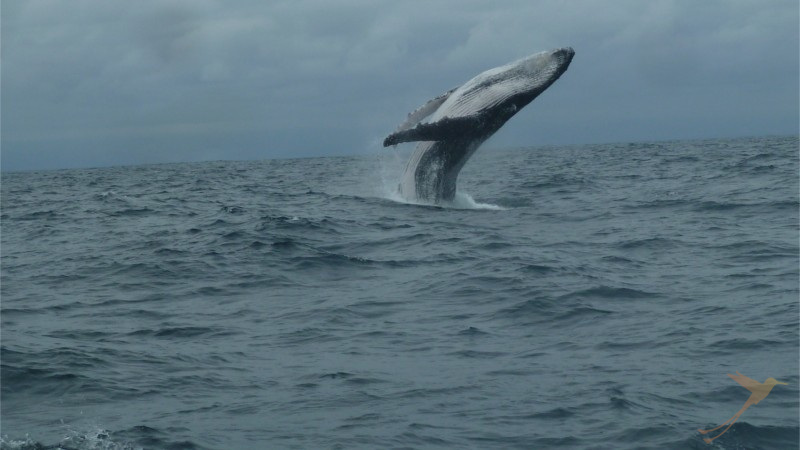 If that post woke your interest about whale watching, check out our Ruta del Sol Tour, where you will go whale watching among many other exciting things.